Recently picked up a Samsung Tab 3 with a smashed screen and broken charging port. Replaced the charging port now and hooked it up to power supply. Had no life, plugged it into PC so i could hear the chime when it does turn on and it connected straight away so there is power there. When looking at the back just now, I have the gold ribbon from the screen on the left, new black ribbon from charging port and that's all. Looking online and the back of the tablet, it looks as though there should be a third ribbon on the other side? Is this right? If so, what is that ribbon for and where could i pick one up. If it should power on without it, will a cracked screen matter? I have not received the new screen yet but the digitizer is in good shape, ,cracked screen plugged in. Will the cracked screen matter or should i still see some life on there? 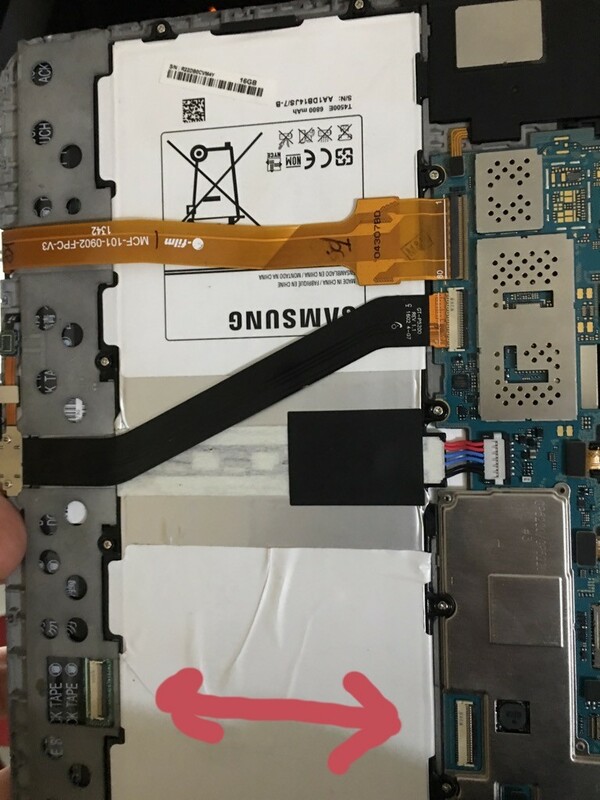 Am i right in saying there should be a ribbon here and this powers the LCD? I don't have a answer to your questions. However, There are a lot of how-to videos on You Tube, you might find your answers there. Thanks lindsay I had a look at quite a lot but no one mentions the particular ribbon. Hope you get it fixed!